Heating your home all winter long can add up — fast. But with North America’s coldest winter in 50 years, it’s also necessary. Unfortunately, this involves high heating costs for a lot of us which is why thermostats have become a popular choice for controlling the temperature at home. However, according to research, a lot of us make some costly mistakes when it comes to using it. In this article, we’ll look at the most common ones that people make when using their thermostat and how you can avoid them to keep your heating bill as low as possible whilst staying cozy and warm throughout the winter. Setting the right temperature on your thermostat is key to feeling comfortable at home. However, these days a lot of people tend to overheat their homes, leading to wasted energy and restless, stuffy nights, resulting in headaches. And whilst comfort cannot be defined absolutely, the official cold weather plan for the US suggests living room temperatures of 70°F, whereas bedrooms and all other occupied rooms should be at 64°F. Rooms should not exceed 75°F. Unfortunately, basic central heating systems don’t allow control of individual room temperatures and all too often there is only a single thermostat located in the hallway, making it more difficult to balance the temperatures at home. However, a simple tip can help here: Turn on the heating and set the radiator valve in your living room to a comfortable level. Then set the valves in the remaining rooms that you are using one level lower. For example, if your living room feels comfortable at level 4 on the radiator valve, your bedroom should be at level 3 or lower. Finally, the thermostat in the hallway should be set to 68°F – since this is the last place to warm up, this will ensure all rooms maintain a comfortable temperature without overheating. Unused rooms should have their doors closed and radiators set to the lowest level. If you’ve just come home to a cold house on a freezing winter’s day, it might seem reasonable to turn up your thermostat. But that won’t help you feel warm and comfortable any quicker. The reason for that is simple: A thermostat has no control over how quickly your house heats up; all it does is set the final temperature for your comfort level. It’s best to think of a basic thermostat as a temperature limiter. It allows the heating to be fully on until the set temperature is reached, at which point the thermostat will turn the heating off until the temperature drops again. Turning your thermostat higher than your comfort level will, therefore, allow the system to overheat the rooms, making them uncomfortably warm and stuffy and, as a result, waste energy. As a general rule, the best thing to do is lower your temperature when you’re not at home. The science behind this is simple: the amount of heat your home loses is linked to the difference in temperature between inside your house and outside. The colder it is outside, the more heat you lose; the warmer it is inside, the more heat you lose. Accordingly, the less heat you lose, the less energy you have to use to maintain a comfortable temperature at home. That is why it’s more efficient to turn the heating down below your comfort levels when you’re away. For more information on this, please read our article on how to reduce heat loss in your home. If setting a consistent, slightly lower temperature can save money, then why do so many people not follow this simple rule? The reason for that is easy to explain: coming home to a cold house causes most people to turn the thermostat up higher than normal comfort level, overheating the house and wasting the money they have saved by using a low temperature when they were out. This is where programmable thermostats work well, ensuring you come home to warm rooms that have been running efficiently when you were out. Unfortunately, things can get a bit more complicated when your schedule changes or, also, with longer-response systems, such as radiators and hydronic underfloor heating. This is where a smart thermostat can help you save a lot of money. The best smart thermostats learn the exact time it takes to warm your house (which is unique to your home) and will use this in conjunction with how far away you are from coming home. By doing this, they make sure the system activates at just the right time automatically, getting the maximum efficiency without sacrificing comfort levels. A lot of people turn off the heating completely when they leave the house. However, this can put your home at risk of dampness, mould growth and burst pipes. Fortunately, most homes are insulated well enough, so they don’t drop to damagingly low temperatures in the course of a day. And for the same reason, your home doesn’t likely drop to worryingly low temperatures within one day when the heating is off, using a setback temperature doesn’t mean the heating is on when you’re out. If the setback temperature is right for your home, the heating will be off whilst you’re away for a normal amount of time, but protected from dropping too far if you’re out for longer than expected. Getting the setback temperature right for your home can take a while and might require a bit of experimenting, but a good starting point is 16 degrees. The average home needs approximately 1 hour to warm up from 16 degrees to 21 degrees, so you should adjust your program accordingly. Here, smart thermostats can remove the hassle of experimentation by automatically calculating the best temperature to use for your home when you’re away and activating the heating to warm up your rooms just in time for your arrival. Wearing an extra layer of clothes, such as a jumper, can increase the temperature you feel by up to 3 degrees. In addition to that, government research has shown that lowering the average temperature in your home by 1 degree can save up to 10% on your heating bills. In other words: Putting on a jumper allows you to set the thermostat at a lower temperature and can save you over a £150 per year on your average heating bill. So next time, just try and wear an extra layer of clothing before you turn up the heating. 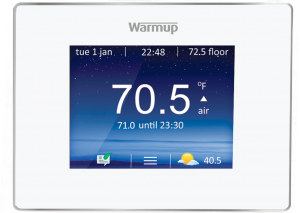 Read our guide to learn more about thermostats and find out which one best suits your needs.